This Out-of-this-World Corn Dip (also know as Crack Corn Dip) is a crowd pleasing appetizer that has become my go-to party recipe. It’s easy to make and will always great rave reviews! Greetings all! I hope you had a fab Fourth of July. I know I did. Though, I must admit having a holiday mid-week always screws me up. Not only do I have no idea what day it is, my productivity schedule is completely out of whack. Anyone else? Yesterday I whipped up an impromptu dip for a little swimming nosh at my Dad’s house. I hadn’t made this dip in over five years and honestly forgot how delicious it really is. And, you know me, it’s super simple to put together an it makes a ginormous amount of dip. Two quick notes – I couldn’t find the corn with died peppers, so I just used plain sweet corn and added in 1/4 cup of chopped roasted red peppers. Fabulous! Also, take the time to make sure everything is drained really, really well. This dip can get runny if you don’t. Also the longer it sets, the more the cheese soaks up any liquids. EASY Fruit Dip – so good! 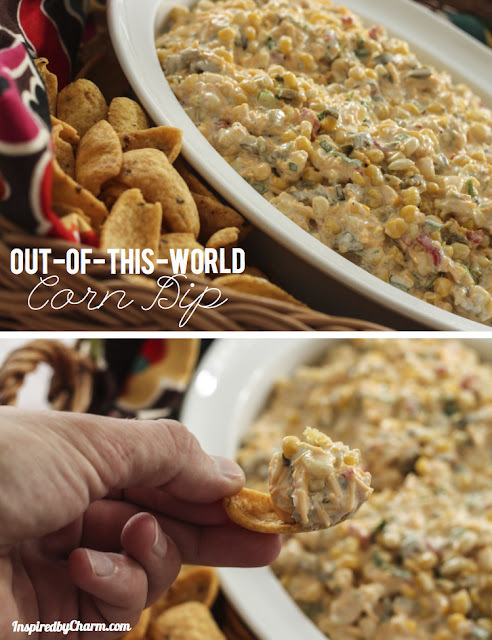 Trust me, this Out-of-this-World Corn Dip (Crack Corn Dip) is edible gold! It’s has a small kick (use less jalapeños if you don’t want it as spicy), but I love that. So fab! Have you ever made this before? If not, are you tempted to make it now? 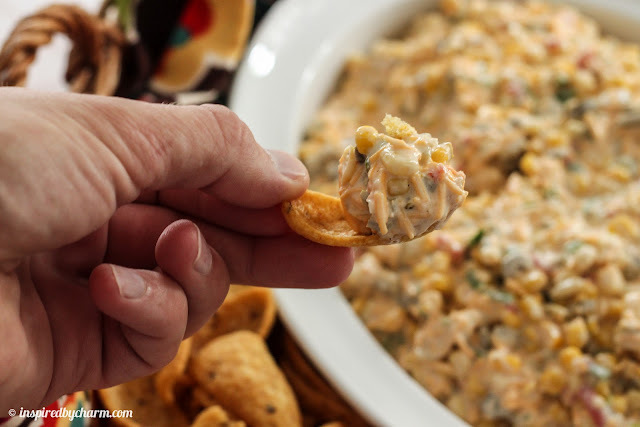 This Out-of-this-World Corn Dip (also know as Crack Corn Dip) is a crowd pleasing appetizer that has become my go-to party recipe. It's easy to make and will always great rave reviews! In a large bowl, mix all ingredients except chips. Chill two hours to overnight. Serve with your favorite chips (I used Fritos and Tostitos) for scooping. Anything eaten on a Frito Scoop is out of this world if you ask me! Those things have crack in them! I’ve been making this and my family loves it! I actually have added black beans rinsed and drained with a tsp of taco seasoning to it as well. Very versatile! Its yummy! Oh my fave dip ever!!!! I always subsitute greek yogurt for the sour cream and add in a red pepper. More veggies and color! Yum!! Very tempted to make it tonight-thanks so much for sharing, looks amazing! Made this very dip a few weeks ago and it was delicious! They ate it all! That looks so good!! It’s definitely going on my to try list! Thanks. I’ve never made it but it looks so good I want to give it a try! Recently found you through pintrest and have enjoyed your pins…have even tried some of your recipes. Thanks and happy pinning. Fresh Sweet Corn is 6 for a dollar here in Seattle. I wonder if it would work well? I made a fresh corn and avocado salsa for the fourth. Are you using the Mexican corn that has the peppers in it? Hi Michael! We love a very similar version in our home that uses the Mexi-corn. We call it “corn dip crack” if that’s any indication on how addicted we are to it. 😉 Love the version you shared as well, will have to give it a try! Ohoho! Sounds delicious! Have a lovely weekend! Found you through pinterest… I love that you love Sarah Richardson. I love her too. I’m following your Sarah Board now. This dip looks delish. I have company company coming tomorrow evening so I’m making this if I can find the ingredients. We travel through your beautiful state when we head south snowbirding in the winter. Love it! It’s fun to discover dips that aren’t the ‘run of the mill!’ Thanks for sharing it! I noticed several people mentioned that they found you on Pinterest…and I did as well. You’ve a trove of great pins. Funny how you, too have a really mixed up week when the holiday is in the middle. I actually missed having our usual Thursday night pizza at a local cafe where they make fresh grilled pizza on the patio. I even had a guest staying with us with whom I raved about the pizza. We missed taking her as I thought it was Saturday not Thursday, yesterday! Phooey. Today seemed like Monday. Arrgh! Sounds like your 4th was Extraordinary! I wonder how this would be if you put it in a crock pot & got the cheese really melty & served it as a hot dip? Did you try that ? Did it work out ok ? As always Michael, thank you! Your recipes have never disappointed! I can’t wait to try this one. And yes…it will take me a month to get back on track and figure out what day it really is! LOL! Thanks! I saw this yesterday and decided to make it today for a party. It is awesome. I only had a small can of chipotle chiles in adobo sauce, so I chopped a few of those real small, removed the seeds and added a few tablespoons of the adobo sauce. I’ve never had corn dip, so thank you! Is there a substitute for the mayo? I am not a big mayo fan and I am trying to stay from that much fat. Hey buddy!! and all! has anyone tried this warm? that’s sort of what I was thinking too! Perfect dip for summer! Pinning it now! Great recipe, Michael!! Looks so good! THANK YOU THANK YOU THANK YOU!!! I’ve been looking for this recipe….I had something just like this several years ago (without the jalapeño papers) and have been searching for the recipe! They lady that brought it to my sons end of season soccer party called it a dump dip…and rattled off what was in it, but i couldn’t ever remember. I’m so excited! This was INCREDIBLE!! I got so many compliments, and then I used the leftovers for a burrito with ground hamburger, shredded cheese and salsa. SO GOOD! Hi Michael – Your corn dip sounds AMAZING! Yum. Thank you so much for linking up – so happy to have you! Thanks for sharing the recipe, it looks delicious! I was craving fritos today, and lo and behold I find Michael’s blog on this dip, it will make me insane until I make it and embibe! This looks amazing. Great timing with corning showing up in Farmer’s Markets now. Love the Fritos for dipping, too. That’s such a throwback to my childhood–favorite snack back in the day. I not only think this dish looks yummy it is. I took it to a Church social and everyone asked for the recipe. Your not kidding it is ediable gold. Couldn’t quit eating it. Very easy to make. The only thing I would do differently is use a corn chip that was less salty. I was wondering about fresh corn from the cob as well.. Wonder if I should blanch it in boiling water first. This dip is much better served warm when the cheese is melted! I use a small crock pot and set it to high to melt everything, then once melted keep it on warm. I’v made this too. My son got it off of his teacher. Christmas we use Red & green Peppers. It’s always a hit !! I’ll bet this would be considered a meal if I added chopped,shredded chicken. Thanks again for sharing and linking…we appreciate it! Made this for a Ladies Craft Fellowship and everyone loved it. I couldn’t find Mexicorn at the store so I used Southwest Corn (peppers, black beans, & onion) and it worked great! Saw this on Pinterest and had to try it. Brought it to a snack day at the office today and requests for the recipe have been hitting my in box like crazy. The dip was gone in a flash. It does make a large amount but with this crowd I will have to double it next time. Good stuff and so dang easy! I substituted fresh jalepenos for the canned. Just made this dip for a party tomorrow. It’s awesome! Made this for a get together this past weekend…cut the jalepeno amount in half…but it was loved by all. Wondering if this has ever been considered heated then served like a spin-artichoke dip?? This dip is SO.GOOD. So easy and such a crowd pleaser!! Shared your deliciousness with my readers here: http://seektobemerry.blogspot.com/2013/05/just-dip-it.html Thanks for the inspiration! It’s my favorite! Thanks for sharing! Super yummy with fresh corn!!! Yummy thank you!!! Oohh! I bet! You’re welcome! Did you cook the corn, blanch it, or use it raw? I served this as a hot dip on Christmas Eve and everyone raved about it. I highly recommend serving it this way. Just saw this on pinterest……I added a packet of fiesta ranch dried dip mix and it was awesome!! This looks amazing! Will definitely be trying it, so thanks for sharing! I added 1teaspoon of both chili powder and cumin. I am tying to copy a spicy corn dip sold at hy-vee grocery stores in iowa. It came darn close. Yum! If you really to take it up a notch… Add tobacco sauce…lots of it. When you add it to all the other ingredients, you can taste it but only a touch hot….unless you use the whole bottle…..which I have and everyone said ” Boy, that’s got a kick…but I like!!!! Help! I’m a bit confused with the jalapenos part of the recipe. Do you drain the juice, and add all the jalapenos to the dip? Or add just some of the juice for taste?? Sorry if it’s a dumb question—never made corn dip before, and don’t want to mess it up haha. Love your site Michael! 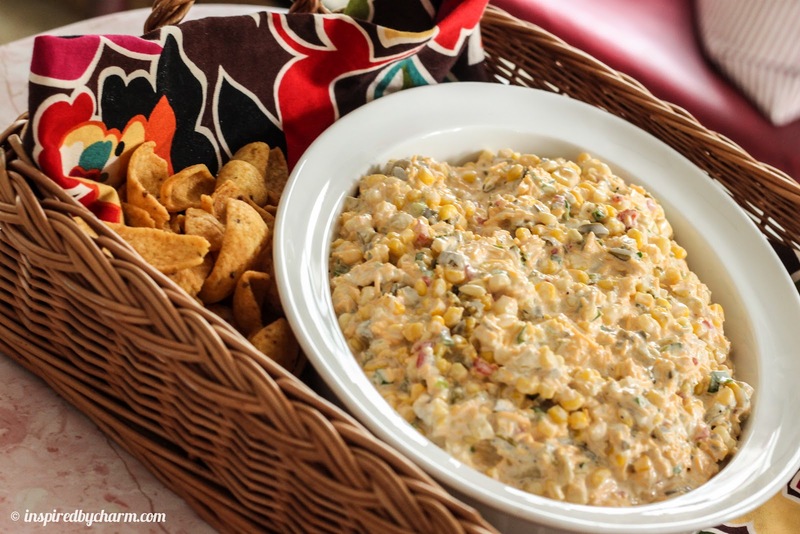 We’ve been making the corn dip for years, calling it “Kansas Corn Dip” – a bit different as we use a can of drained Ro-tel in place of the jalapenos & green chiles. Had a friend visiting from Kansas, and she said “Now I’m from Kansas and have never heard of this”! We tried changing the name to “Colorado Corn Dip”, but could not remember to call it that, so, to us, this is “Kansas Corn Dip”. Regardless of the name, it’s a crowd pleasing dip for sure! I found this recipe and immediately said “I’m making this for dinner tomorrow”. I am going to add grilled/shredded chicken to it and some extra fresh chopped bell peppers and put in in a glass baking dish and bake it for a bit. Can’t wait! My sincerest thanks for a great dinner idea. You’ll have to let me know how this turns out. I’ve never warmed it so I’m VERY curious to read about your results. I made this over the 4th holiday weekend, not for any particular event, just to have on hand for weekend munching. I halved the recipe as best I could and it is indeed delicious. I added a bit of crumbled bacon, which certainly didn’t hurt. It’s delicious with or without that addition. Next time, I may try to bake it to see what happens. I just tried this and thought it was going to be too spicy but it’s delicious! Love it! My 2yo and I couldn’t stop eating it and the BBQ isn’t until tomorrow! can you heat this up so the cheese melts? I don’t know. It’s SOOOO good cold. It may be great heated up, but I’ve never tried it. Crack Corn Dip looks awesome. Not too difficult looking either. Thanks for sharing. I’ve made this several times. It’s fantastic! And, as someone else suggested, even better during fresh corn season. Thanks for this winner, Michael. I make this a couple times of year (especially during the summer) and it always gets RAVE reviews. Love this recipe. I made this for a 4th of July BBQ. It was delicious and so easy!! Thank you! I made this for my recent family gathering, it was amazing!!! So glad you enjoyed it! It’s one of my favorites! This dip is AMAZING! It’s been my go-to for a few years now and I make it several times a year for parties. People love it! I made this for an office event and everyone raved about it and at least one person asked me for the recipe. It truly is as easy as it appears. 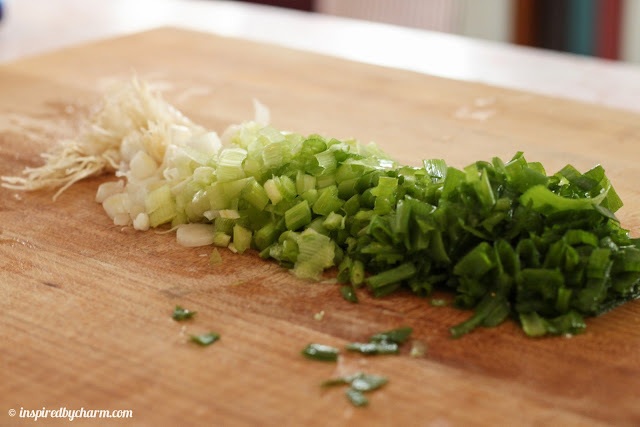 I find that opening the cans and letting them drain while I chop the green onions and do the rest of the prep helps cut down the excess moisture. I made this the night before it was needed and the consistency was nice and thick. How far ahead can I make this deep ??? I need some “way ahead” recipes for appetizers. I have to do some stuff for my son’s rehearsal but do not have time to do last minute dips !! You could make this a day in advance. I love this dip just as much the next day!